Marnix Busstra debuted in the United States with 2009’s Twelve Piece and the following year’s Trinary Motion, both of which he co-led with vibist Mike Mainieri of Steps Ahead. 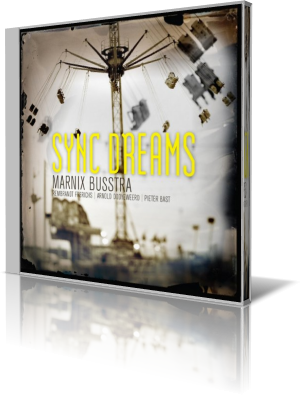 Now, the Dutch guitarist steps out with Sync Dreams (Buzz Music Records, 2013). With Busstra are Rembrandt Frerichs on piano, Arnold Dooyeweerd on double bass and Pieter Bast on drums. Busstra plays electric sitar on the placid “Earth Tone” to open the set. Busstra says of the instrument that he studied Indian music and played the sitar for a few year but had to stop because it’s a tough, physically demanding instrument. “You really have to play it every day because it’s hard on your fingers.” The song has a slight, Pat Metheny edge to it with just a hint of Santana when Busstra shifts to electric guitar. His accompanists are fully involved throughout the piece. “Down, and Up Again” is a lively 6/8 song that puts drums and bass a little closer to the front. Busstra carries the melody and stretches out aplenty. Shortly after the two and a half-minute mark, Frerichs takes point. The solo is intense and has been compared to something one might expect from Herbie Hancock. Underneath (although not by much), Bast and Dooyeweerd go to town, making this one of the more enjoyable selections on an album that’s loaded with enjoyable sounds. Busstra’s father, Jan Busstra, was a working musician and piano teacher with a great love of jazz. Older brother Berthil plays keyboards and is co-leader with Marnix of the Buzz Bros Band. Their sister, Margreet, is a professional singer and multi-instrumentalist. Marnix tried several instruments before settling on guitar at age 14. He joined his first band while in high school during the 1970s. After playing with a series of other bands, Busstra ultimately landed with Mainieri and now leads his own quartet.